Are you and your team frustrated trying to manage interactions with parents regarding your centres waitlist? Manually re-entering child and parent details and care requirements into a spreadsheet. Contacting parents to confirm you received the application. Finding waitlist records to address parent questions about where their application is up to. Calling and emailing parents multiple times to reconfirm their interest in a vacancy. Confirm the initial parent waitlist request via both a text and email. Automate the entry of parent and child details and requested care requirements. Prioritise waitlist applicants based on your selection criteria, including sibling at centre. Record all information regarding the waitlist request including date initial request received, date of changes to request and any comments entered by staff. Reconfirm application details with parent via email and text, including opportunity for the parent to update care requirements. This process can be performed for a single applicant or for your entire waitlist irrespective of the number of applicants. 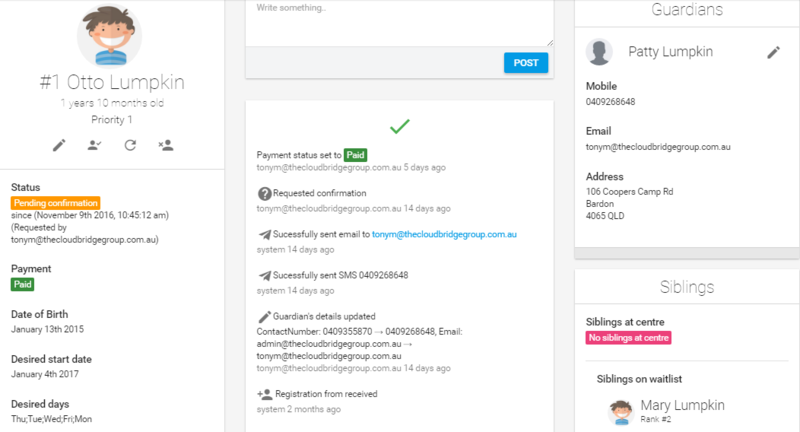 For a free three-month trial or to gain further details on our Cloudbridge’s Waitlist Management Solution please visit our website at https://thecloudbridgegroup.com.au/waitlisting-and-occupancy or contact us at enquiry@thecloudbridgegroup.com.au or on 0409 268 648.